R.E.M. Tackles Songs of Faith and Revenge R.E.M. isn't exactly religious, but spiritual themes do creep into its music. Singer Michael Stipe says he comes from a "place of faith," and that generations of men in the Stipe family have been Methodist ministers. Widely billed as R.E.M. 's best album in ages, Accelerate takes inspiration from religious issues. 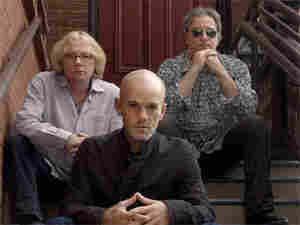 The rock band R.E.M. isn't exactly religious, yet spiritual themes do creep into its music. Singer Michael Stipe tells host Steve Inskeep he comes from a "place of faith," and that generations of men in the Stipe family have been Methodist ministers. On what's being called R.E.M. 's best new album in ages, Accelerate addresses religious issues, while also drawing inspiration from faith. "Houston," in particular, deals with questions of faith in response to what happened to the victims of Hurricane Katrina. The narrator's religious faith is challenged by the events he's witnessed — particularly the Bush administration's response in the storm's aftermath. The song came about when bassist and keyboardist Mike Mills heard guitarist Peter Buck playing a new guitar part, and was inspired to respond with an ominous organ line. Stipe said the music presented an opportunity to write about Hurricane Katrina. "I've always felt since the early days," Stipe says, "that when I'm writing a vocal part, my job is to make it sound like that's the only vocal part that [could] ever possibly go along to that piece of music." Accelerate's opening track takes its title and inspiration from the English clergyman and metaphysical poet, George Herbert. "Living Well Is the Best Revenge" is a common phrase, and the band admits to only recently discussing what the term really means. Buck jokingly adds, "When I was 15, I had no idea what that meant. That made no sense to me. I thought revenge was the best revenge." Stipe had been reading much about the media around that time, and "Living Well" was his response. He imagines himself in the song turning a table onto a television personality, singing, "Don't turn your talking points on me / History will set me free." Stipe admits that the act is a little immature, but ultimately cathartic. After 25 years as one of the most beloved and acclaimed bands in rock music, R.E.M. needed a shot of adrenaline to get fans excited again. In advance of its 14th studio album, Accelerate, the group performed a bracing and even blistering set at South by Southwest, webcast live on NPR.org from Stubbs in Austin, Tex., on March 12. With Accelerate due in April, R.E.M. showcased many of the new album's most electric and energetic songs — each of which demonstrated a retreat from the more tepid sounds of the disc's poorly received predecessor, Around the Sun. Ever since original drummer Bill Berry quit the band in 1997, R.E.M. has experimented more in the studio, but its new material looks to the prime of the group's '80s discography, while maintaining a modern sheen. Judging from the response by the thousands of fans in attendance — as well as the engaged and outspoken performance by frontman Michael Stipe — there's reason for optimism. Hear the other bands from this concert: Dead Confederate, Papercranes, Johnathan Rice, Summerbirds in the Cellar.